Blackjack is not only a fun game, but has had a long history. Because of that, there are now many variations of the basic game. The basic game of course is to get as close to 21 points as possible without going over and going "bust." And of course a second important goal is to beat the dealer - that is, to do better than the dealer does at getting close to 21. The single most common variation is that blackjack can be played with any number of decks - from 1 to perhaps 8 decks, and then of course there are also continuous card shufflers nowadays that can act like even more than 8 decks. Because the odds in blackjack are not bad for the player, Casinos have invented some new blackjack variations that have decent odds but of course not as good as the original blackjack game. Some of these games are: Spanish 21, Super Fun 21, Double Diamond, and 6:5 Blackjack. What each of these games have in common is that they give you a feature, but then also take away a feature of normal blackjack. Spanish 21 allows you to double down or surrender most any time. However, the ten cards (but not face cards) are eliminated from the deck, lowering the players odds. So, some gains, some losses. The end result a little less good than the normal game of blackjack. 6:5 blackjack allows people to play with a single deck- generally more favorable to the players. However, blackjacks there only pay 6:5 (1.2 to 1) and not 1.5 to 1 - so not as good. Likewise, Super Fun 21 uses "Double Diamond" blackjack. Again, it allows more rules such as double downs and surrenders later in the game. However, blackjack pay is again lower. In the case of double diamond blackjacks only pay 1:1 - unless both cards of the blackjack are diamonds - then it would pay 2:1. All of these variations are slightly lower in odds than the normal game of blackjack. However, since some of them offer some more play possibilities, some people do like playing them. There are even more game variations. There is something called "5-card charlie", where players can win if they are less than 21 points and hold 5 cards in a single hand. There are other variations of that called "6-card charlie" and "7-card charlie". You can guess how those work. Most casinos do not offer those options anymore, but some might. There are also variations of what is allowed - such as additional double down plays, or surrender plays or more. 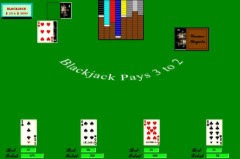 The rpsoft 2000 blackjack game addresses many of the common blackjack rule variations - including of course the simple option for number of decks. One easy way to practice the game in a simple atmosphere and to also modify the games options as you wish is with the blackjack game available here from rpsoft 2000 software. The game has many features that can help one learn to at least defend themselves a little in a regular blackjack game or one of the variations. The game includes many options - including how many decks in play, dealer hitting on soft 17 or not, number of cards in a deck to be dealt, basic options of basic blackjack, Spanish 21, 6:5 single deck blackjack, Super Fun 21 and many more options. The deal mechanism of the game has been gone over carefully to reflect the real odds of a deck of cards being dealt. And as one plays the game, simple hint charts are provided by pressing the "f2" key during a game, or the more complete hint chart for that game by pressing "f3". Several hint charts are provided - showing the differences in play between single deck blackjack, multiple deck blackjack, Spanish 21 and more. And as you become familiar with the hint charts and best play, you will likely need the charts less and less. Then, perhaps you are ready for the real thing. However, always keep in mind that even if you are great at Basic Strategy and have close to even up odds with the house, that luck can bring large swings either for or against you for short periods of play. That is perhaps why we call it gambling. However, why not practice and learn basic strategy to get those odds as good as you can? Or if you wish to not take any risks at all, simply enjoy the rpsoft 2000 blackjack game. Even though we ourselves have played in many casinos in the US and internationally, we still enjoy the software game also.